Pat has been training dogs and helping owners with their dog's problem behaviors for over 25 years. 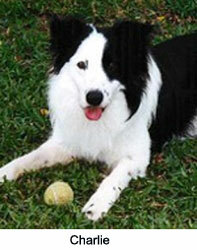 Pat and her dogs compete and have titles in obedience, rally, agility, and flyball. 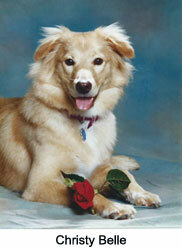 They also enjoy canine musical freestyle and perform their dance routines in demos around Houston and Katy. In the past few years Pat and her dogs have been involved in exciting new dog sports including K9 Nose Work, Rally FrEe and Treibball. She is thrilled to be able to offer these classes at Happy Hounds! Pat's husband, Jim, is also very involved in doing things with their dogs. 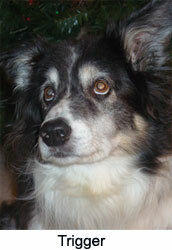 His dog, Trigger, was one of the fastest dogs in flyball and agility (and he was Jim's best friend). Pat and Jim have traveled around the country together to compete in various sports - they like to win, but they also just like to have fun with their dogs. In addition to helping owners teach their dogs good manners and sports, Pat works with many dog rescue groups to help find homes for shelter and rescue dogs. She is currently working with the volunteers and dogs at the Houston Humane Society. 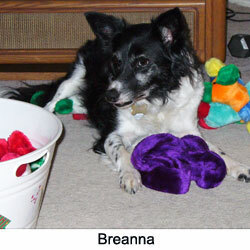 She has developed a program to teach good manners to the hard to place dogs to help them find loving homes. Using positive training methods these dogs quickly learn to love training and working. Pat and Jim have fostered many dogs for Border Collie Rescue, TX, a group that helps Border Collies find new families that will love them. Pat has a special love for rescued dogs and most of her dogs are from shelters or rescue groups. 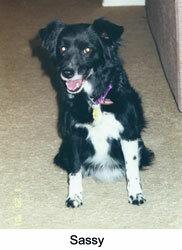 Pat's Border Collie, Star, lives up to her name! She loves to work and totally enjoys dancing, nose work and Treibball! Star helps demo in classes and helps in private lessons. Star started out as a foster of Pat's. She was bought by a family from a breeder when she was only 5 weeks old! They turned her into a shelter in Austin when she was 9 weeks old. She was terrified of everyone and everything. She was labeled a "fear biter" and was going to be euthanized. Her only way out was through rescue. Star growled at Pat when they first met and tried to bite her. She got her name because even through the fear Pat could see that she had "star" potential :). Star won her heart and became one of Pat's foster blessings. She is 8 years old now and I think you'll agree that she has come a long way. When you watch this video, please notice that she stays focused throughout the performance and even when she glances off for a second she comes right back and does what she is supposed to do - even with hundreds of people around the ring watching her. For a dog with her background, this is a very special song. 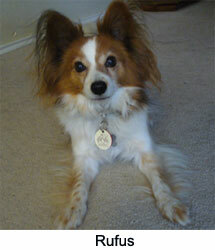 Rufus, a Papillon, was given to Pat when he was 9 months old. His previous owner loved him, but didn't know how to channel his energy into something productive (he was always getting into trouble and she really wanted a lap dog). As Pat worked with Rufus she found him to be eager to learn and always ready to work. Rufus enjoys dancing and agility, but his main passion is being a therapy dog - he loves to work with children. They currently visit the Children's Assessment Center twice a month where Rufus gets to show off his tricks. Rufus is 11 years old now, but still thinks he's a youngster. Since he lives with Border Collies he works hard to keep up with them, but he does enjoy hanging out on Jim's chair in the evenings. Bonnie is Pat's demo dog for beginner classes and has started helping in other classes as well. Bonnie was also a rescue - she was bought from a breeder when she was only 4 weeks old. The woman kept her for five weeks and then turned her into rescue. Bonnie had some issues due to being separated from her mom and siblings when she was too young, but with a lot of work she has overcome them! 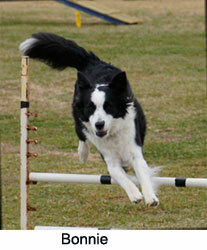 Pat and Bonnie recently started competing in agility. Bonnie totally enjoys agility and is very good at it - she qualified for all the Level One titles in CPE agility in just three days! Each day is a new adventure for Bonnie and she is a joy to have around. JJ is the newest addition to the Marshall household (named after their favorite football player, JJ Watt :). 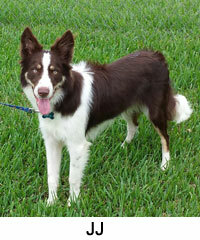 He is a gorgeous red/white Border Collie who has tons of energy and is always looking for new things to do and learn. JJ was turned into a shelter when he was 9 months old. He was there for three weeks, but no one wanted to adopt him so he was scheduled to be euthanized... Pat and Jim found out about him thanks to Border Collie Rescue Texas and pulled him just in time. He's a handful, but they love him! Stay tuned for more JJ updates! Heidi (the one that started Pat in dog training!) was a beautiful German Shepherd/collie mix. Pat's son found Heidi and brought her home in 1985 when she was about a year old. They found Heidi's owners who did not want her back - mainly because she was a wild one and they didn't want to take the time to train her. Their loss! Pat started taking Heidi to a training school and got hooked on training. The bond that developed between Pat and Heidi was enormous. Pat had owned dogs her entire life, but had never had a relationship with one like she had with Heidi. They learned to understand each other and Pat started to realize how important training is - not only for the dog, but also for the people who own them. She started reading everything she could about training in addition to volunteering in classes, attending seminars and doing whatever it took to learn how to help dogs and their owners have the kind of relationship she had with Heidi. 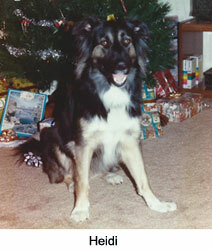 They lost Heidi in 1996....but, her legacy lives on in the lives changed because of this wonderful dog!